Just received the latest edition of Backtrack. As usual another super read! Interesting interview with Tony Lomas who is less than complimentary about Charles Ochiltree during his time at Coventry. Recall Tony's less than satisfactory enforced move to Cowley with Garry Middleton going the other way. Tony now resides in Reeth (James Herriot Country) and somewhere I visit regularly...if I bump into him will definitely have a chat. Also another good insight with another 'Rebel' Colin 'Joe' Gooddy....had an interesting slant about his one year spent at Cradley Heath. Chris Sear (SRA Secretary) discusses the eventual fall of the rider's union and how 'Gentleman' Hans Nielsen was always supportive of him and the cause. If you don't subscribe I couldn't recommend it enough for those interesting in reading about speedway's last 'Golden Age'...how I'm glad I followed the sport during that period. The former SRA secretary is Colin Gear. ISSUE 87 (JULY - AUGUST, 2018) of Backtrack is out now and here's a flavour of what to expect . 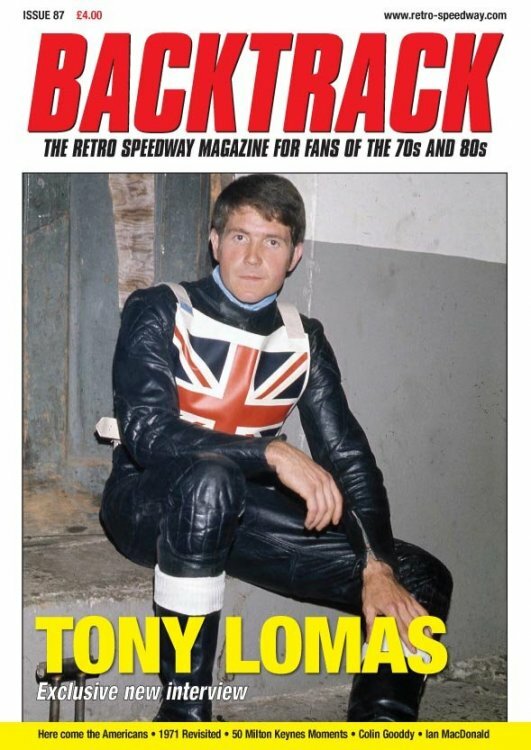 . .
Third in the British Final, a maximum for England and just a point away from reaching the World Final, Tony Lomas held down a full-time job and started a new business while scaling the heights in a brilliant 1971 campaign that put him on the speedway map. Tony McDonald tracked him down in the Yorkshire Dales to find out why his career with home-town club Coventry ended acrimoniously and how a protracted move led to title-winning glory with Exeter. Tony Lomas quotes: "I was naive and overawed. I led in every race for a couple of races but then let people pass me because I didn't think I was good enough to be in front. It sounds silly but that was how I felt in the big meetings at that time. I wanted to do well but didn't think I was capable." "Being a local lad, I hadn't cost Coventry a penny in transfer fees, I never received any signing-on money or guarantees and my travelling expenses to Brandon were 25p per meeting." "It was an honour to ride in the same team as him but, at the same time, I was in awe of him because he was so good. Ivan was in his own bubble but, all credit to him, he was fantastic." "The Exeter promoters treated me well. They paid me £750 for signing-on at the start of the championship year but Wally came on the following winter and said they didn't want to pay as much as that in '75. I was disappointed – they'd just won the league and were getting tremendous crowds – but I told him that if he had to lose a rider (through Rider Control), I was prepared to consider going." Martin Rogers, editor of Bruce Penhall's Stars and Bikes book in 1980, recalls the all-American heroes whose unique brand of showmanship brought colour and razzmatazz to the British League scene . . . plus how British fans remember the Californians. Steve Luxton reports from California, where former team-mates and friends gathered to see Scott Autrey honoured by his peers. An unlikely move to Poole revitalised the near veteran Colin Gooddy's career. Phil Chard catches up with one of the sport's great characters whose much-travelled career also included spells in the Backtrack era with Oxford, Cradley Heath and Crayford. Martin Neal talks to the former Berwick, Edinburgh and Aussie favourite Brett Saunders who admits he's lucky to be alive after suffering a serious stoke last December. In the first of a new series of interviews, we turn the tables on those who have written countless words on speedway. Tony McDonald has a long chat with the founding editor of Speedway Mail. Andrew Skeels reflects on a season which heralded a world title for the speedway's first Great Dane, a British history-maker in Poland, domestic bliss for Belle Vue, Hackney, Eastbourne and Ipswich, the return of league racing to Birmingham and the end for Romford and Wembley. In this third and final part, we bring you more behind-the-scenes revelations from former riders' union boss, including a riders' revolt against referee Frank Ebdon, the SRA's battle to keep foreign riders out of the second division, Colin's disgust when the Lee Richardson Memorial meeting was scrapped and more. Martin Neal catches up with the former Ipswich, Newcastle, Peterborough, Canterbury and Arena-Essex rider now enjoying family life in Brisbane, Australia. It's 40 years since speedway came to the Buckinghamshire new town famous for its concrete cows and network of roundabouts. Rob Peasley looks back at the most happy and gloomy times for Knights whose star riders included Bob Humphreys, Andy Grahame, Bert Harkins, Nigel Sparshott, Keith White, Steve Payne, Trevor Banks, Troy Butler and Gordon Kennett. Brett Alderton and Craig Featherby, both killed in the early 80s, are also remembered. ...sorry the name Chris always comes to mind! Don't know why!